It’s been wonderful to watch Sam start to interact with different toys, seeing how he reacts to the noisy ones, chew the ones that shouldn’t really be chewed and rattle & shake everything else. 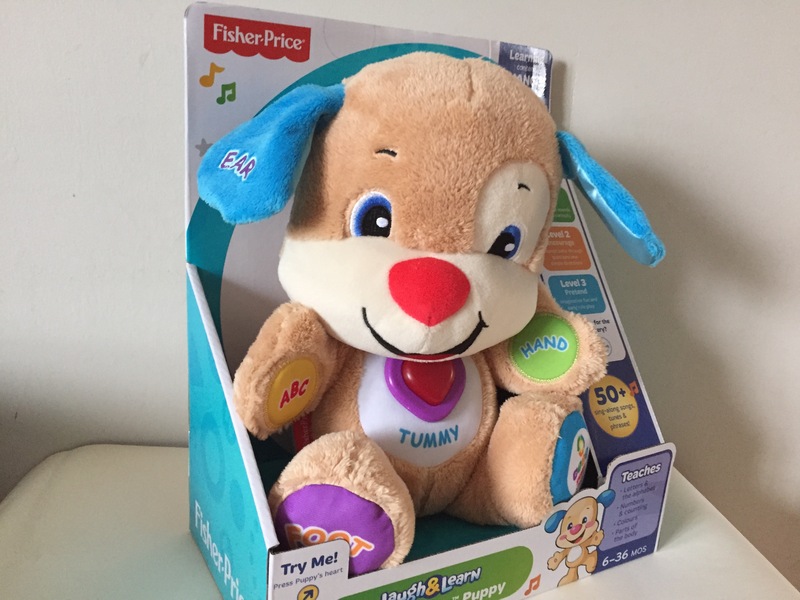 We were lucky enough to be sent the new Fisher Price Smart Stages Puppy to play with and we’ve been having so much fun! I’m usually a bit dubious about these singing soft toys. They’re not normally very cuddly, you can sometimes be fishing around forever to find the bit that gets it to make a noise and often I want to cut to sound out of them! I was really impressed with the puppy. Not only is he cute, soft and cuddly, he’s got Smart Stages™ technology which basically means that you can select the stage best for baby, from first words at the 6 month stage, simple directions at 12 months to early role play at the 18 month stage. There are large pressing points on the ear, tummy, foot, both hands and heart, they all have different phrases and songs which change with each stage offering lots of variety to keep baby interested. Sam was able to set them off by giving them a squeeze or a chew. The songs are lovely, there’s some old favourites like ‘twinkle twinkle’ and ‘incy wincy.’ Some songs are unique to the puppy but just as catchy and easy to learn so you can sing along, badly in my case. The heart lights up and twinkles along to the music, it even does a heart beat which I just thought was so sweet. There’s also 2 choices for volume and a way to turn the puppy off, always great with a noisy toy. It wasn’t just me who liked playing with trying out the smart stages puppy. Sam really liked playing with him too and I suppose he is the best judge. He loves singing so really enjoyed the songs, especially the ‘ABC’ song. We even discovered after a particularly tight cuddle that if you press the heart for a few seconds puppy will sing all of the songs from each stage one after the other. He found puppys ears fascinating and spent ages running them through his fingers, he also loved to have a chew of his nose! We played with all of the stages, Sam liked them all now so I know when he is able to understand more he will be able to interact with it. A toy that will definitely grow with him and will last him for years to come. He also has a sister, click here to check her out! We were sent the Fisher Price Smart Stages Puppy for the purpose of this review. All words and opinions are our own and as always honest.